St. Patrick’s Day – a toe-tapping, TapSnapping good time! St. Patrick’s Day is a celebration long known for fun, good cheer, and, perhaps, a bit of mischief. St. Patrick’s Day parties tend to be memorable for those very same reasons! Here are the St. Patrick’s Day party essentials that will make your bash stand out from the rest. What would a St. Patrick’s Day party be without green drinks?! In addition to staples, Irish whisky and Guinness, impress your guests with themed cocktails. We love these recipes curated by Examiner.com and Cosmopolitan. Balance out your drink list with some non-alcoholic drinks or mocktails. Better Homes and Gardens has a good idea collection. A party can’t be great without food – especially an Irish party! Epicurious has a great selection of recipes to inspire; you’re bound to find something to suit the flavor of your party. Whether you invite a live band or a DJ, traditional Irish music is essential in getting toes tapping and bodies dancing! Take entertainment even further and invite your local Irish dancing school to lead your guests in a few jigs and reels. With fun drinks, yummy food, and music, your guests will be in great form for some Irish shenanigans. Capture those moments! 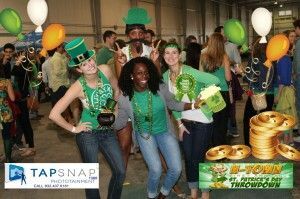 Book a TapSnap photo booth; digital props and a green screen background will have your guests visiting the Emerald Isle, enjoying a pint in an Irish pub or looking rather like a leprechaun. TapSnap’s social sharing capabilities will have friends of your guests green with envy!